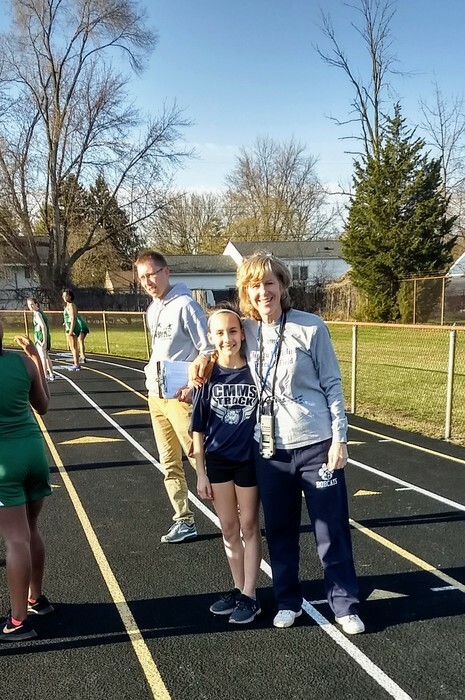 Our 6th graders enjoying beautiful weather and the fun of their 1st track meet! The CMMS School Store is open during normal school hours. Stop in and check out our fabulous merchandise. Get some great new T-shirts for the spring and summer! 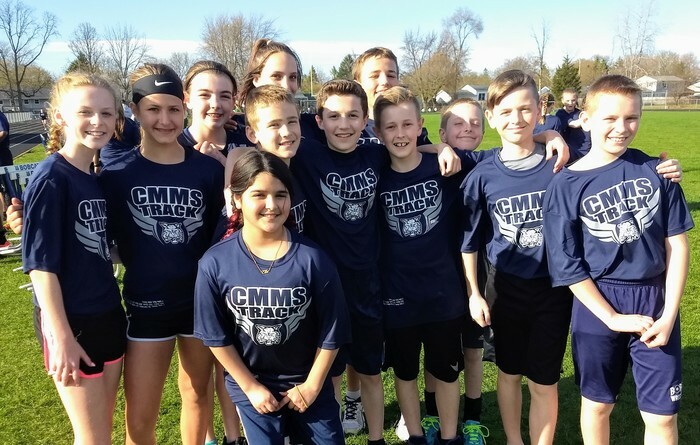 CMMS is continually raising funds throughout the year. We are always accepting Boxtops for Education and Aunt Millie's bread UPC's. Sign up for the ShopARoo app and record your receipts from stores to give the school credit for your purchases. Your help is greatly appreciated! Have you been shopping for your Easter outfits yet? Don't forget that CMMS participates in the Shop-A-Roo saving app. Go to shoparoo.com and download the app to your phone before you purchase your Easter outfits! Just scan your receipts and CMMS will receive points for your purchases! When you preparing dinner for Easter this Sunday, don't forget to save your Boxtops for Education and UPC's from Aunt Millie's bread products! Have your student turn them into the school office. We receive 10 cents for each boxtop and 5 cents for each UPC from Aunt Millie's! If you purchased clothing from the online School Store, it is available for pickup in the main office. Also, we will have new clothing items available in the school store during normal school hours starting on Friday. Stop by and check out our selection! 8th Grade Washington DC meeting will be Wednesday, May 1 at 6:30 in the CMMS commons to go over final details of the trip May 7-11. If you cannot make it your child can pick up information. Parents/Guardians: This is a message to let you know that our third marking period award assemblies are scheduled for Wednesday, April 17th and Thursday, April 18th 6th grade assemblies will be on the 17th at 1:00 pm 7th grade assemblies will be on the 18th at 9:00 am 8th grade assemblies will be on the 18th at 1:00 pm The list of students receiving awards will be posted to Skyward no later than the afternoon of Friday, April 12th If you have any questions about the awards assemblies, please contact the school at 686-7640. Just a friendly reminder to our 8th graders and their parents that tomorrow, April 9th, is PSAT/MSTEP testing. We ask that all of our 8th graders get a good nights sleep and be sure to eat breakfast tomorrow morning. Please make sure you know what room to report to for testing. CMMS is still collecting Boxtops for Education! Each one is worth 10 cents to our school. We also collect Aunt Millie's School Spirit UPC's. They are worth 5 cents. Send your collection to CMMS. We have a box in the office. Thanks for your support! Wondering how you can help out CMMS? We are collecting Boxtops for Education, Aunt Millie's School Spirit UPC's and Tyson A+ tabs. You can drop off your collections to CMMS during normal school hours or send them with a student! Every little bit helps us provide some nice "extras" for our students! 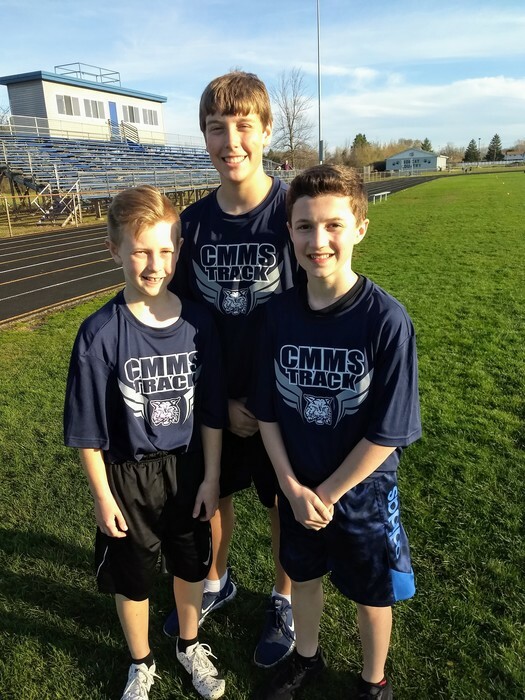 Spring Attire can be ordered through this Sunday at the CMMS Online Store. Go to https://cmms2019spiritwear.itemorder.com to place an order that will be delivered to CMMS by March 29th. 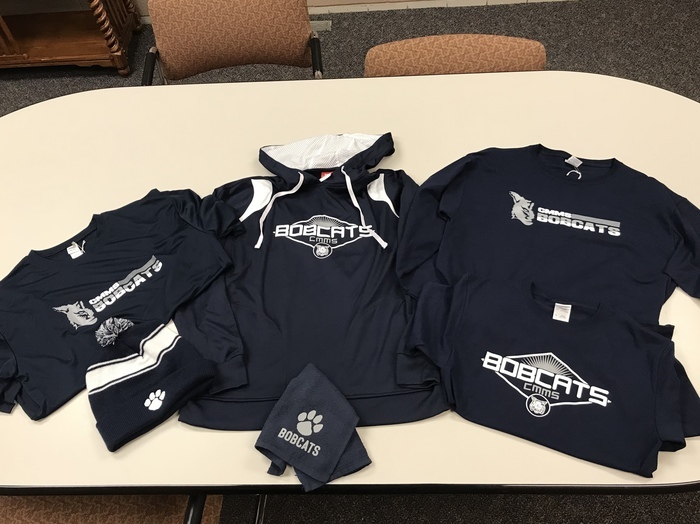 Don't miss out on this last chance of the school year for new swag! This is a reminder that Monday, March 18th will be a half day of school for our students so that our staff can participate in a very important professional development session in the afternoon. 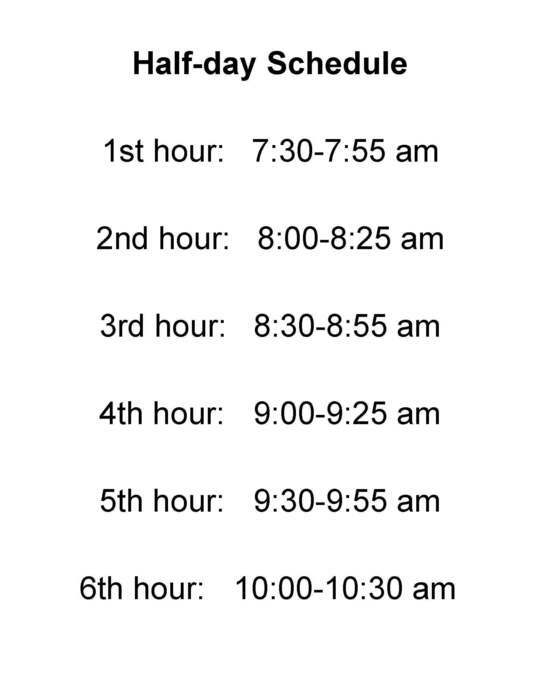 Students will be dismissed at 10:30 a.m. and we will follow the attached schedule. Please see the attached flyer for information on the March Madness Mingle on Friday, March 22nd. This event is open to all CMMS students. 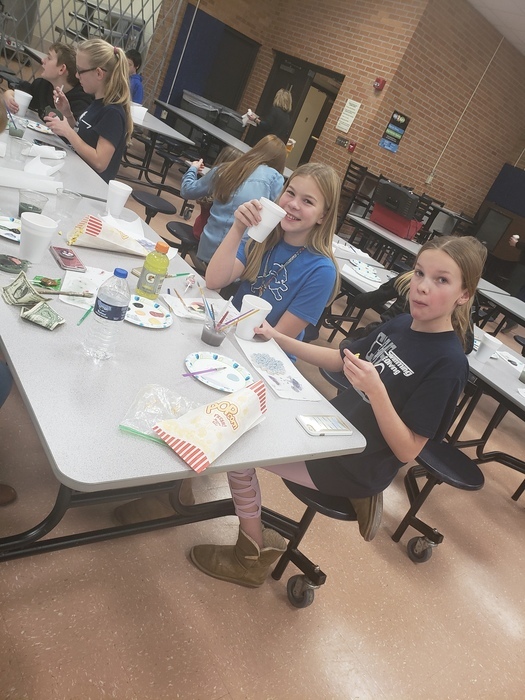 Help us earn a few dollars for CMMS! We collect Boxtops for Education, Aunt Millie's School Spirit UPC's, Tyson A+ tags and enrolled in the Shoparoo App. Drop off your Boxtops, UPC's and tags at the office and send a snapshot of receipts to Shoparoo! It's that easy to help! CMMS Online School Store is open through Sunday! Check out our new designs! Go to https://cmms2019spiritwear.itemorder.com. All items will be delivered by Spring Break! Hey, all of you Bobcats how about a little St. Patrick's day fun! We are having a dance with games and prizes on Thursday 2:30-4:30! The cost is $5.00 dancing, games, prizes and snacks included. There will also be pizza and additional snacks for $1.00. Don't miss the fun! CMMS Movie Night is here! Doors open at 5:30 tonight and the movie will start at 6:00 PM! Come see "E.T." with your family and have a relaxing evening! Concessions will be available. Tomorrow is Movie Night at CMMS! Come join us in viewing "E.T. - the Extraterrestrial". The cost is only $1 per person with a maximum of $5 per family. Concessions will be available for purchase. Bring the whole family for a relaxing evening of fun at CMMS! Doors open at 5:30 and movie time is 6:00! Washington DC final payment is due by Friday or you have a $35.00 late fee. Also, final fundraiser is due Monday. The CMMS Spring Online Store is now open!! Go to https://cmms2019spiritwear.itemorder.com and check out all the new items and designs. The online store will remain open until March 17th! "E.T. - the Extra-Terrestrial" will be making a stop at CMMS this Friday, March 8th! Bring the entire family to watch a great movie and relax!! The cost is $1 per person with a maximum of $5 per family. The doors open at 5:30 PM and movie time is 6:00 PM. Concessions will be available for sale. Bring your blanket, sleeping bag or whatever else you may feel comfortable on and join us on Friday! Thanks!! The CMMS Movie Night is back on! After postponing our original date, we are hosting a Movie Night on Friday, March 8th at 6 PM. The movie will be "E.T. - the Extraterrestrial". The cost is $1 per person, with a maximum of $5 per family. Bring your blanket, sleeping bag, pillow, bean bag chair or whatever makes you comfortable and enjoy a family movie night. Concessions like popcorn and Reese's Pieces will be available for purchase. The doors will open at 5:30 and movie time is 6:00 PM. The movie last two hours. 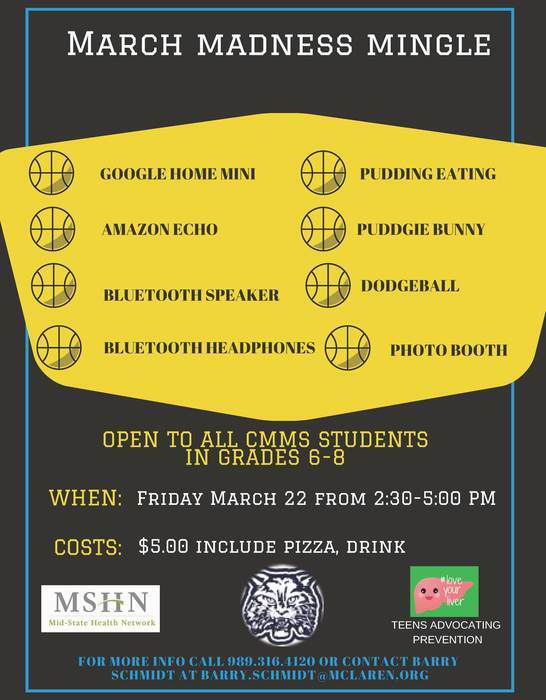 Bring Mom, Dad, brother and sister to a fun evening here at CMMS!! 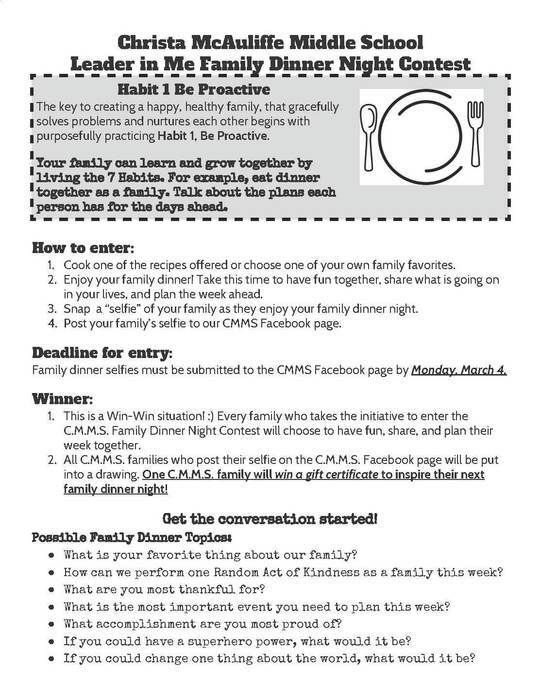 Please see the attached flyer regarding our Family Night Dinner Challenge. 8th Graders your John Glenn course sheets for next years classes are due to your Flex teacher by March 6. The Book Fair in the CMMS Library will remain open through Monday 2/25. If you missed the book fair this week this is your chance to pick up bargain books and other fun items. The Scholastic book Fair will be open Thursday night during conferences in the CMMS library. This book fair has many marked down books and other fun items to purchase. If you are a bargain shopper this book fair is for you. Due to potentially hazardous weather conditions this afternoon and evening, parent-teacher conferences have been cancelled for tonight, Wednesday, February 20th. The Scholastic Book Fair will be open from 5 to 8 tonight in the CMMS library during conferences. A lot of discounted items are available for purchase. Please stop by and support your school. 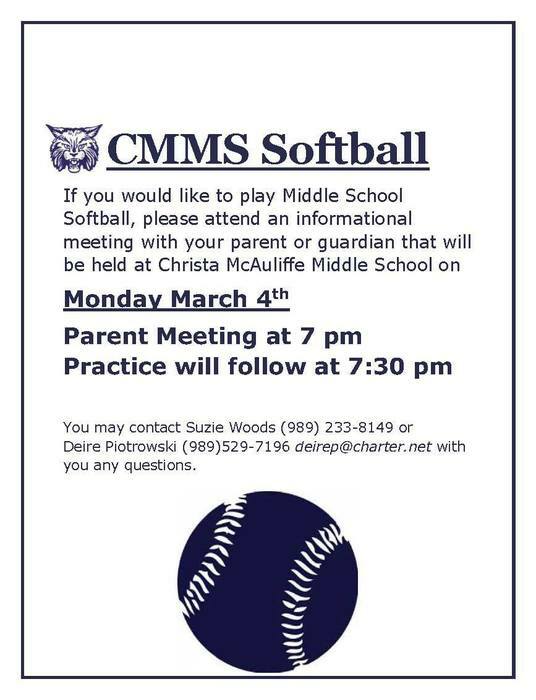 Please see the attached flyer for information on the upcoming CMMS Softball season. Bargain Shoppers - Check out the book fair in the CMMS library. There are over 50 books that are $2.50 or less. Many are just $1.49. Also many fun items are marked down to only a dollar. The Scholastic book fair in the CMMS library began on Monday. 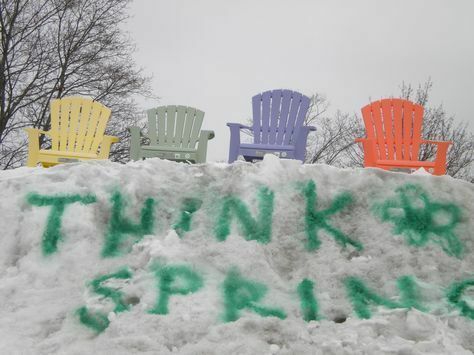 It will be open from 8:15 to 1:45 until Friday, Feb 22. It will also be open during conferences on Wednesday and Thursday 5-8 pm. The link for online purchases is: http://www.scholastic.com/bf/christamcauliffemiddlesch1 Books will be delivered to classrooms, there is no delivery charge. 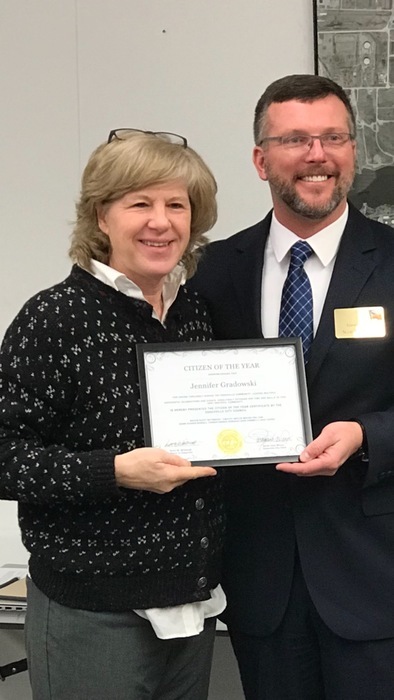 Congratulations to our very own Ms. Gradowski for being named as the "Citizen of the Year" for the city of Essexville. Ms. Gradowski received this award due to her outstanding commitment and dedication to her community. Congratulations Ms. G! We are very proud of you. Due to the several snow days we have experienced lately and the need to keep our students in the classroom, we have decided to cancel the 2nd marking period award assemblies. Students will still be recognized for their achievements and receive their certificates in their FLEX class. Hi, 6th graders! Ms. G. here! 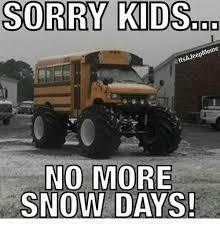 After 3 more snow days, I've decided to offer the extra credit again! For those of you who have already completed 5 activities, you only need to do 3 more for more EC. 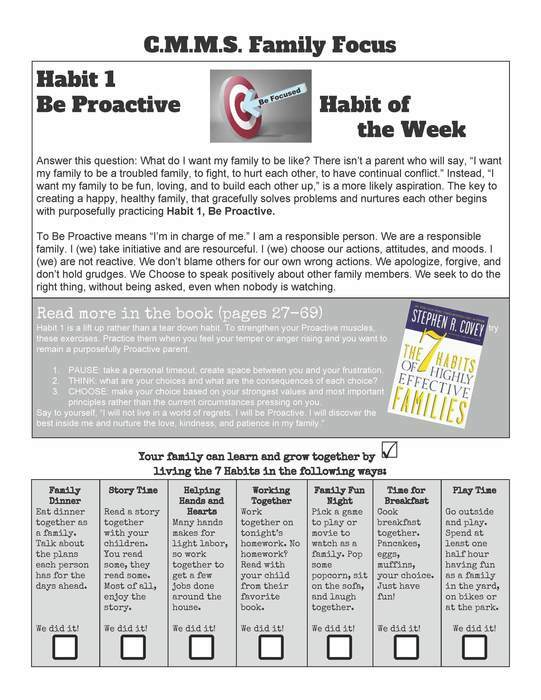 Those who didn't do it last week need to complete 5. 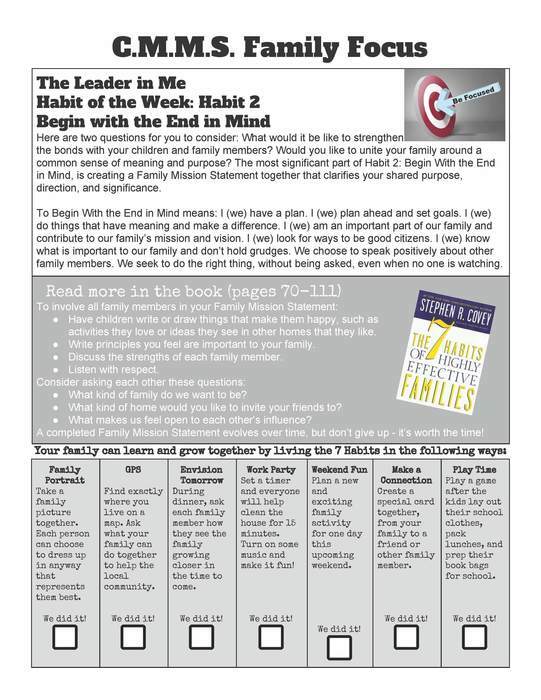 See Planbook, 2/8/19! Happy Snow Day #10! We wanted to let everyone know that when we return to school tomorrow (hopefully) we will be running a Wednesday schedule. Friday will then be a Thursday schedule so that we don't miss any of the block days. See you tomorrow!! Sunday, February 17th at Bay lanes students going to Washington DC or any 8th grader will have a Bowlathon to raise money for their trip from 12:00-3:00. Students earn 100% profit! 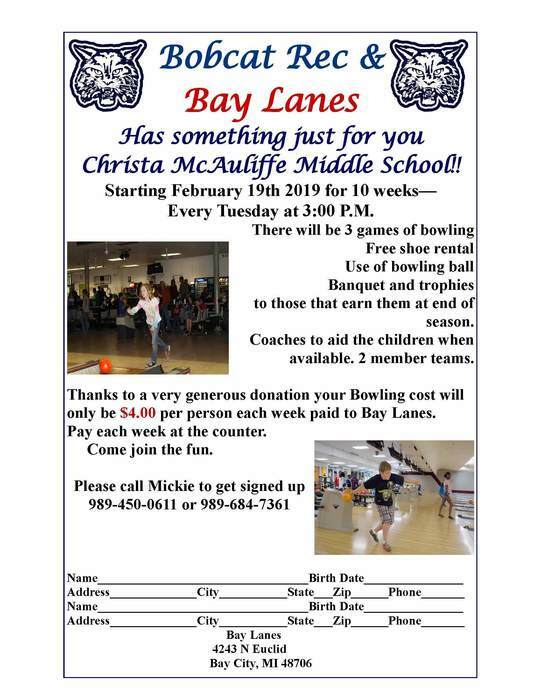 The $6.00 fee for bowling and shoes is due by this Friday...February 8! Just a friendly reminder that today (February 4th) is our last exam day and students will be dismissed at 10:30 am. It looks like mother nature is finally willing to cooperate and let us back into the buildings. We will finally wrap up our last exam day on Monday and students will be dismissed at 10:30 am. We will follow a normal schedule the rest of the week. Block days on Tuesday, Wednesday, and Thursday with a regular schedule on Friday. Also, the second marking period award assemblies originally scheduled for February 8th and 11th will be postponed. Stay tuned for a make-up date for these events. Due to the current weather conditions, CMMS will unfortunately have to postpone our Family Movie Night. We will let everyone know our new date as soon as possible. 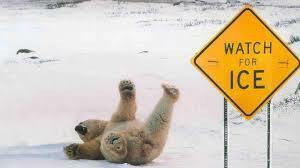 Thanks for your understanding and stay warm! Happy Snow Day #5 Here is the plan for this week at CMMS. Whatever day ends up being the first day of this school week will be our third and final exam day. Students will be dismissed at 10:30 am. Any and all remaining school days that we are in session will be a Monday/Friday schedule. Stay safe and stay warm. Next Friday, February 1st, CMMS will be hosting a Family Movie Night at 6 PM in the CMMS Commons. We will be showing "E.T.- the Extra Terrestrial". This is a great movie for all ages! Bring a blanket, beanbag chair, sleeping bag or whatever makes you comfortable and spend the evening with E.T.! Concessions will be available for purchase as well. All students must be accompanied by parent/guardian. Hope to see you next Friday! Due to our day off from school yesterday we will be making a slight adjustment to the exam schedule. * Wednesday, January 23rd will be a full day of school. We will run a Monday/Friday schedule. * Thursday, January 24th - Exam Day #1 - 1st and 2nd hours (students dismissed at 10:30 am) * Friday, January 25th - Exam Day #2 - 3rd and 4th hours (students dismissed at 10:30 am) * Monday, January 28th - Exam Day #3 - 5th and 6th hours (students dismissed at 10:30 am) ** If we end up not having school tomorrow (January 23rd) we will bump everything on the above schedule back by one day. We apologize for any inconvenience these adjustments may cause and just hope Mother Nature cooperates so that we can get our exams in. CMMS will be hosting a Family Movie Night on Friday, February 1st at 6 PM in the CMMS Commons. Admission is $1 per person. We will be showing "E.T. - the Extra-Terrestrial". Bring a sleeping bag, beanbag chair, body pillow or whatever will make you comfortable and come enjoy the movie! Concessions will be available! Students MUST BE accompanied by a parent/guardian. This is not a drop off/pick up event. 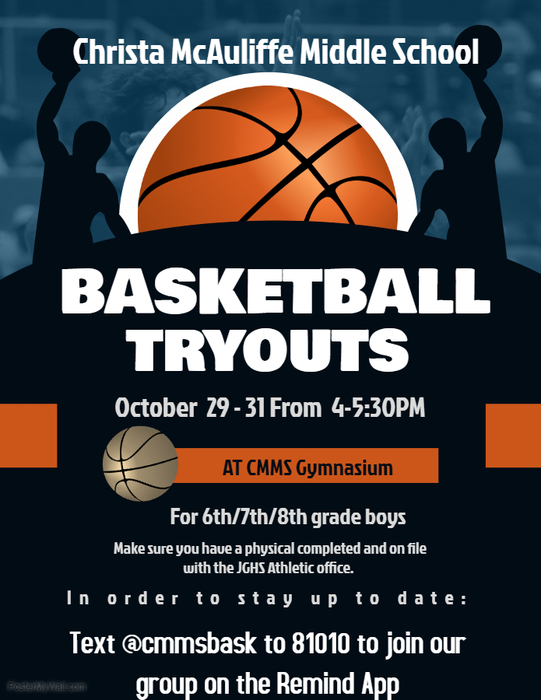 REMINDER: Tryouts start TOMORROW for our CMMS girls volleyball team. Make sure you have your physical form and your pay to participate fee ($25) turned in. Good luck to all of our Lady Bobcats! Just a friendly reminder that CMMS students will be dismissed at 10:30 on exam days next week (Wednesday, Thursday, Friday). Lunch will not be provided on these days. The exam schedule is below. Happy Ice Day #2! Due to school being cancelled today, we will run a Monday/Friday schedule the rest of this week as well as Monday and Tuesday next week. 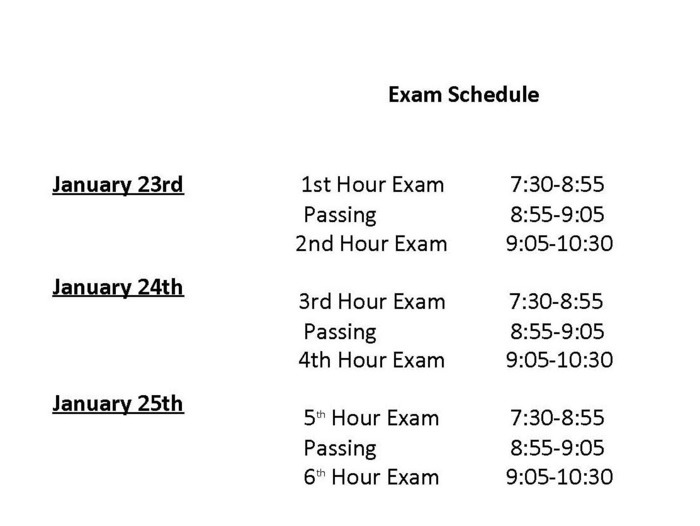 Also remember that exam days begin on January 23rd. 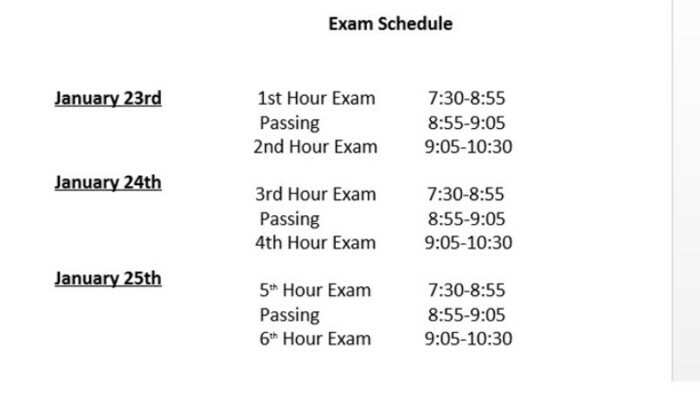 The exam schedule is attached. 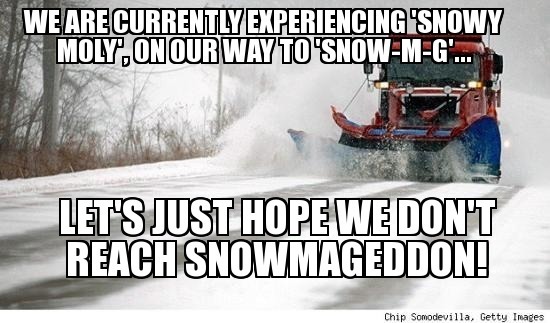 Due to today's unexpected "ice day" we will be running a bit of a different schedule for the rest of the week. Essentially we will pick up where we left off and run a Tuesday schedule tomorrow. That means Thursday will be a Wednesday schedule and we will skip the Friday schedule all together to run our Thursday schedule. Enjoy your day off!! Attention 8th graders going to Washington D.C.: This is just another reminder that scholarship and interest of laying the wreath at Arlington letters are due by January 25. 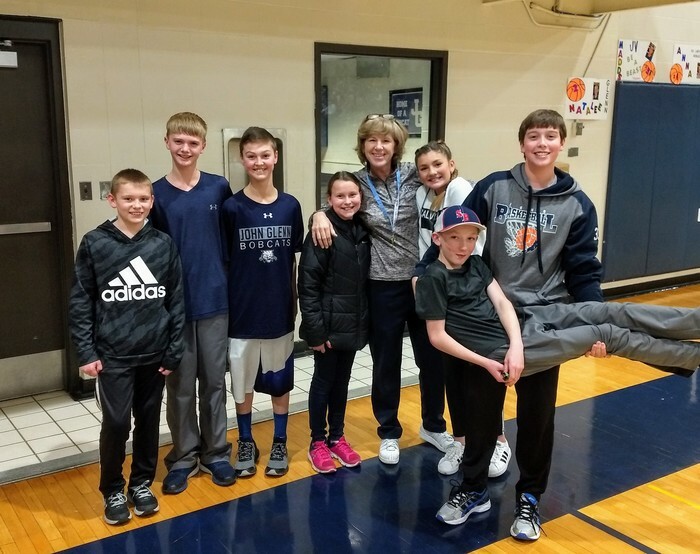 Glad to see some of my 6th graders at the John Glenn v. Western games! I missed you!!! 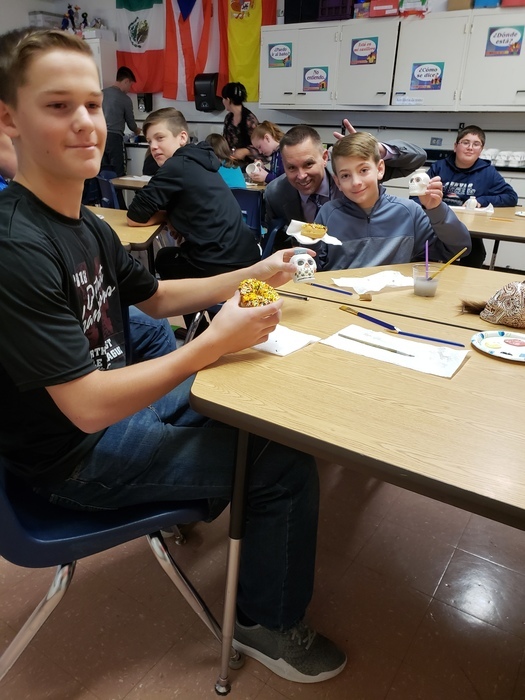 Lucky Lunch Tray Day at CMMS on Friday!! Get the lucky tray in any of the lunch lines and win a prize!! Last minute Christmas shopping? Stop into CMMS during normal school hours and check out the apparel in our school store!! We will also be open during Wednesday's basketball games until 6 PM!! Girls' swim practice has been cancelled for today, Friday, December 14th. Ladies, please remember that you will have your pictures taken on Monday at 2:30 at the JG pool. There are many great new (and old) books in the library for students to check out over the break. Mystery, realistic fiction, adventure, biography and more - it's all there for you! Cozy up with a good book this Winter. If you are planning on attending tonight's CMMS basketball games, stop in at the school store! It will be open until halftime of the second game for you to get your Christmas shopping done!! Show your Christmas spirit next week! Don't forget to dress up each day for a little holiday fun! Washington DC updates: Hungry Howies gift cards will be here next week. Information about scholarship's and the opportunity to represent CMMS at Arlington National Cemetery has been sent out (a pink form). Applications are due January 25. 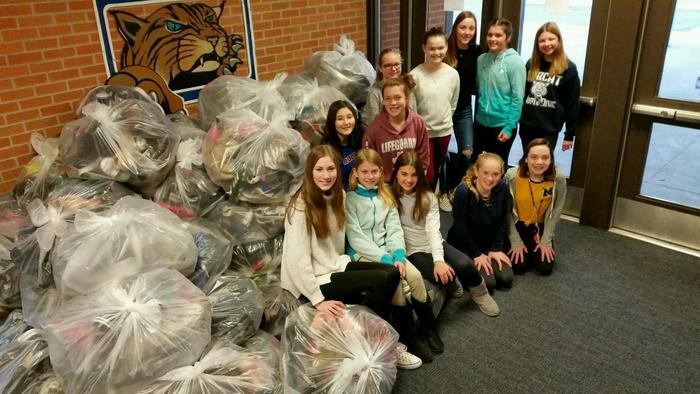 CMMS has wrapped up their Shoe Drive Fundraiser. We collected 1,950 pairs of shoes that are now being sent to underdeveloped or impoverished countries. We would like to thank Hopevale Church and New Life Missionary Church for helping us with our drive. We appreciate their help. For our efforts, CMMS will be receiving approximately $800 from funds2orgs. for our collection. Reminder 8th graders the Hungry Howies fundraiser is due tomorrow! Checks made to CMMS. 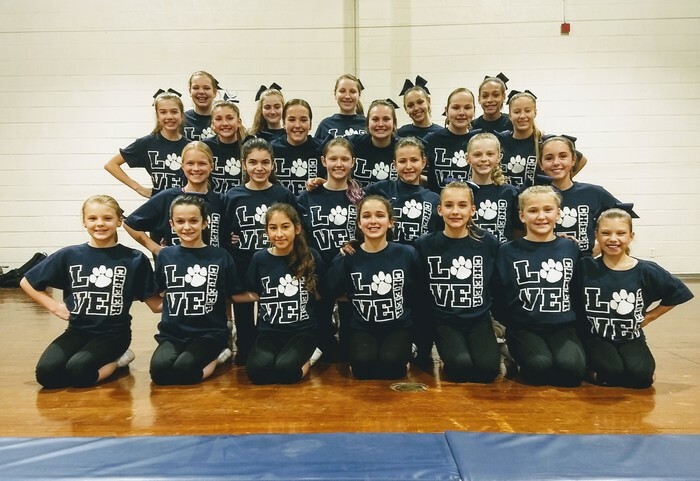 Our cheer team is ready to cheer on our CMMS boys basketball teams as they play Midland Northeast tonight! Coach Taylor has them ready to go! 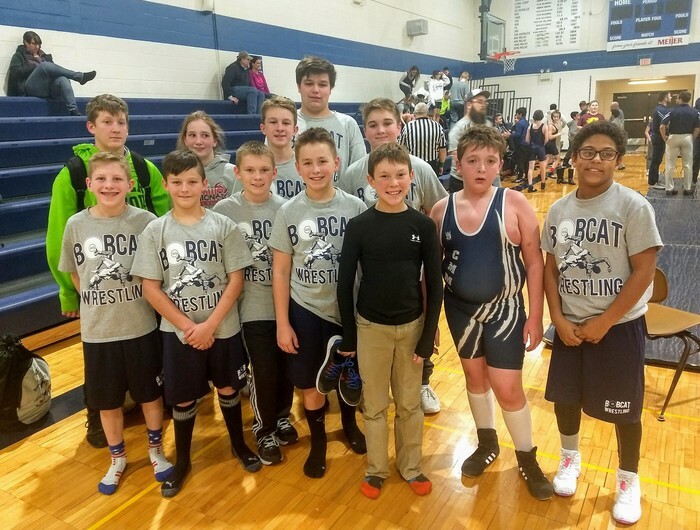 Our Wrestling team! They beat Mount Pleasant 42-19! GREAT CHRISTMAS IDEA!! The CMMS School Store has just gotten some new items in! Stop by during normal school hours and check us out! 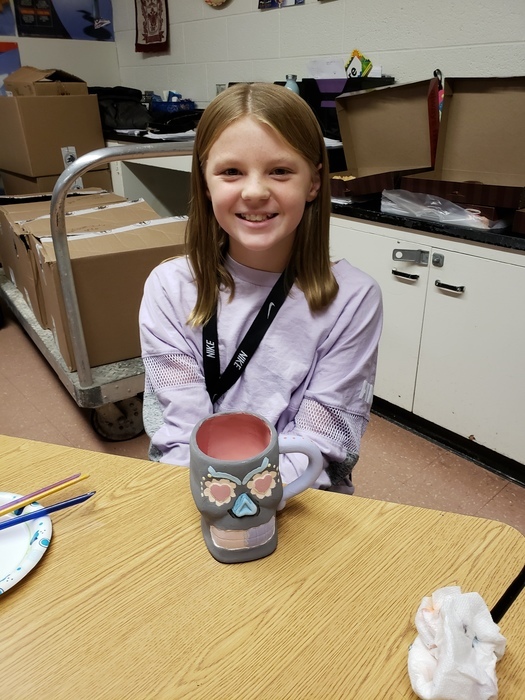 The ornament painting even with Painterly Pottery was a success! Our students painted 168 ornaments. Thank you to all who came. This Friday is your last opportunity to donate your gently worn or new shoes to our Shoe Drive fundraiser. The truck will be here next week to pick up our donations. Please deposit your shoes in the box in the foyer here at CMMS. We appreciate your support! REMINDER: Tomorrow is the Christmas ornament painting event! Students that signed up need to bring cash and be ready for fun. 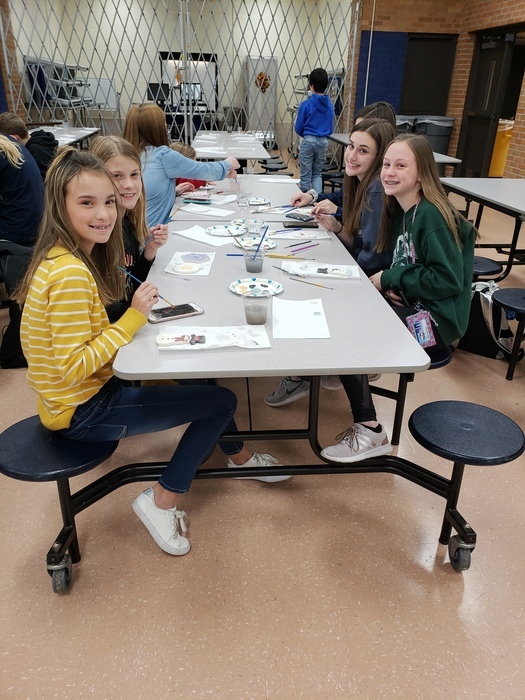 (The cost is $5 per ornament in addition to a concession stand) Students will have from 2:30 to 4:30 to paint. We have well over 100 painters signed up! The CMMS Online School Store will be closing tomorrow!! Get your order in right away and we will have delivery by Dec. 17th!! Visit our website at https://cmmsschoolspiritwear2018.itemorder.com. 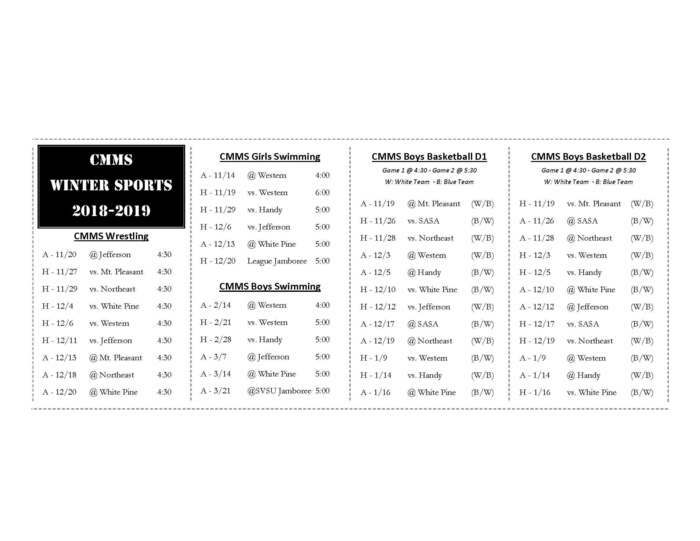 Please see the attached mini-schedule of all of the CMMS winter athletic contests. Special thank you to Mr. Bailey for putting this mini schedule together. CMMS could use your help! With the holidays fast approaching, please remember to clip your BoxTops for Education, Tyson A+ program and the Aunt Millie's School Spirit package signs. We desperately need you to send these items to school. Each one is worth 5 or 10 cents to us!! Also, sign up for the ShopARoo app. Just scan your purchases and a percentage comes back to our school! Happy Holidays!!!! Ready to shop for Christmas? The CMMS OnLine Store is now open! Visit our store at https://cmmsspiritwear2018.itemorder.com and look through our selection! The store will be available until Nov. 30th with delivery by December 17th! We will also have items available on location at CMMS. Stop by during school hours. 7th graders your fundraiser for your end of year field trip ends Monday! Turn in money and order forms to your science teacher no later then Monday 11-19-18. All orders will be in before Christmas break. 8th graders the 3rd bus for Washington D.C. is open make sure to get your deposits in. As soon as deposits are in locking down your space on the trip, profits from the 1st fundraiser will be sent to company. We still have plenty of spaces available if anyone is interested. Attention 8th graders going to Washington D.C. our 2nd fundraiser- Hungry Howie's will be sold from Nov. 7- Nov. 30. Pizza's will sell for $8.00, students will make $5.00 on each pizza sold. The certificates come in a cute little pizza box great for stocking stuffers! 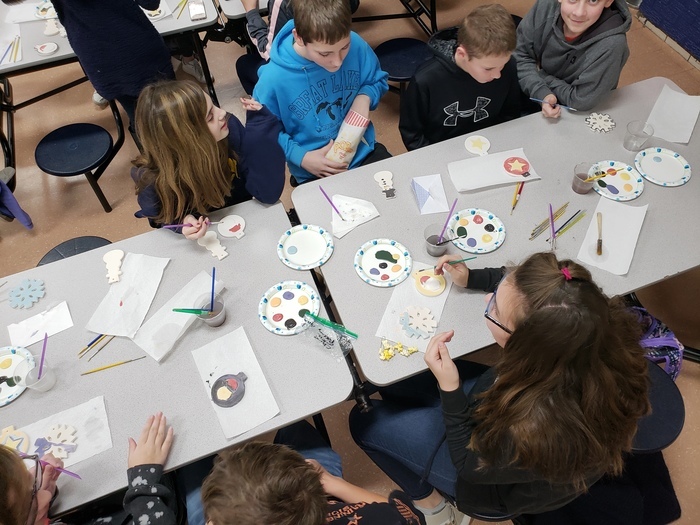 On November 27th, CMMS with be pairing with Painterly Pottery to host an ornament painting event. Cost is $5 per ornament, cash only. Students need to return the form with the number of ornaments they want to their flex teacher ASAP. Hope to see everyone there! 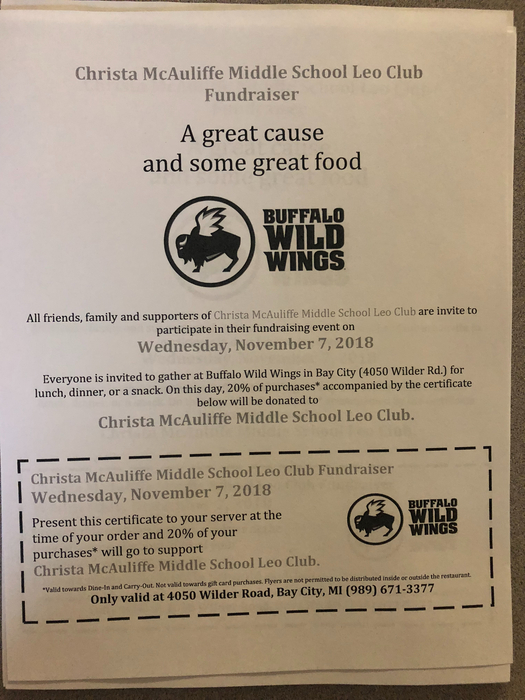 The Leo Club is having a fundraiser at Buffalo Wild Wings on Wilder Road on Wednesday, November 7th. The coupon is attached. (8th graders) If there is any problems with the first fundraiser please send the slip with your child by this Friday so Mrs. Wilford can get it taken care of. Any 8th grade student and/or parent still interested in going to Washington DC the registration is still open! We still need 5-10 people to register to open up a 3rd bus. Any questions please contact Mrs. Wilford ASAP. This is just a friendly reminder that tomorrow (November 1st) is a half day for our students. Dismissal will be at 10:30 am. The 1st marking period award assemblies are as follows: November 14 – 6th Gr @ 11:45 am November 15 – 7th Gr @ 9:00 am November 15 – 8th Gr @ 11:45 am The list of students receiving awards will be posted to Skyward no later than the afternoon of Friday, November 9th. 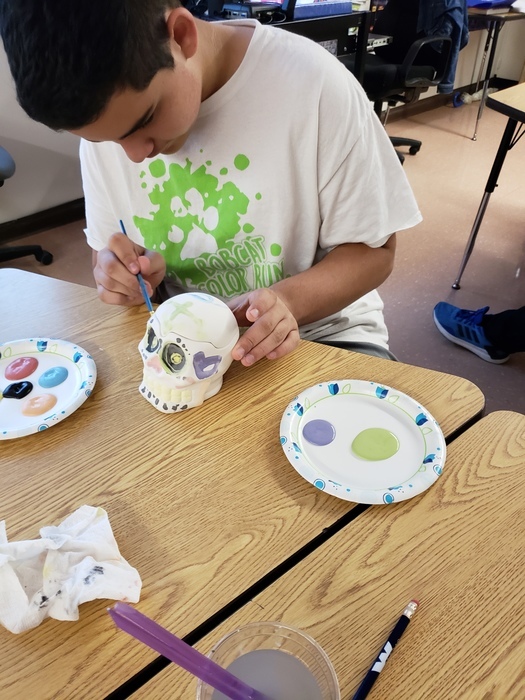 This week, Señora Johnson's Spanish I students painted skulls in preparation for Día de los Muertos. 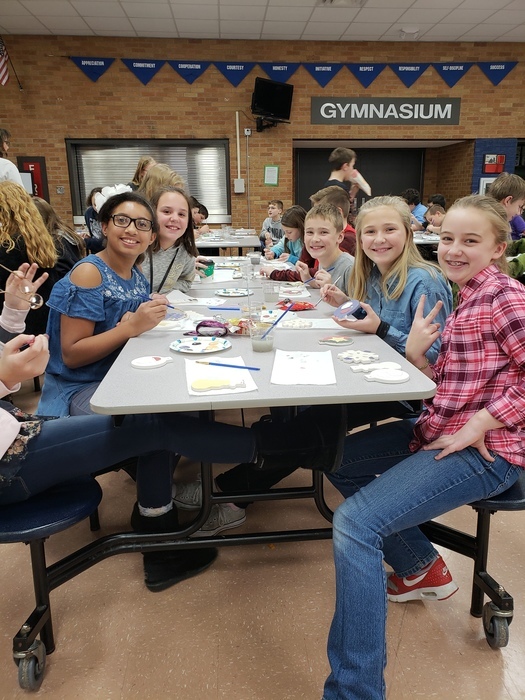 Thank you to Painterly Pottery for coming and helping us with almost 200 pieces of pottery! CMMS is currently looking for an energetic, positive, and fun loving person to supervise and support our students during our lunch hours. 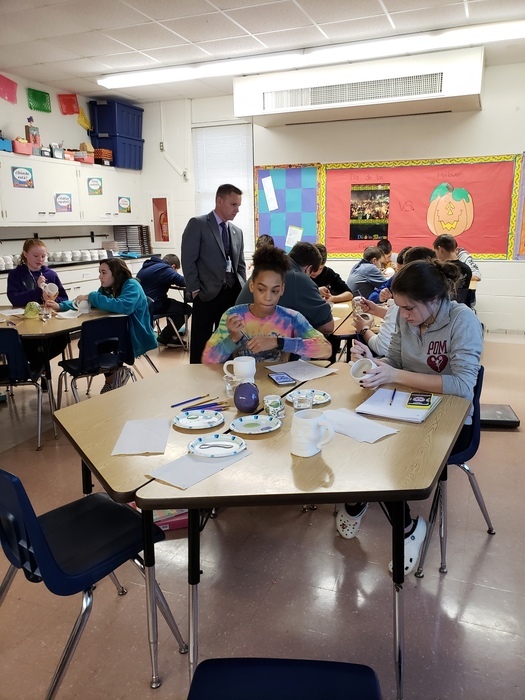 If you are interested in a part-time position as one of our noon-aides, please contact the assistant principal, Renee Mrozinski, by e-mail at mrozinskir@bangorschools.org or by phone at 686-7640 x3205. 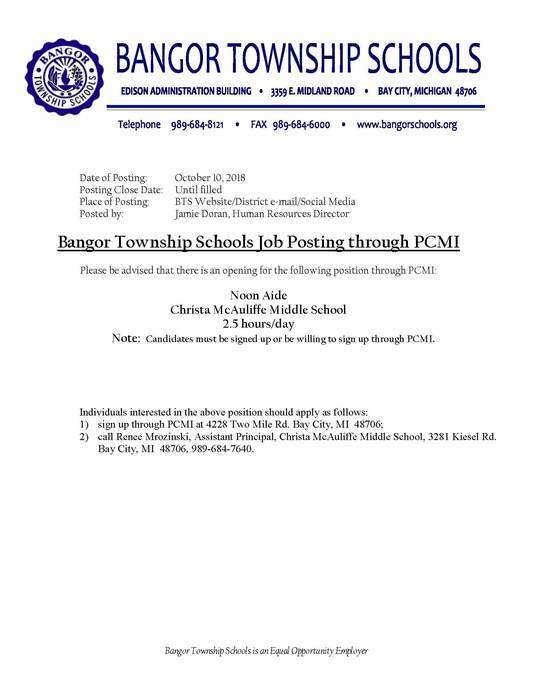 Please see the attached job posting for additional information. ***CORRECTION*** There will not be boys basketball tryouts on October 31st (Halloween). There will be a final tryout date on November 1st from 4:00-5:30 pm. 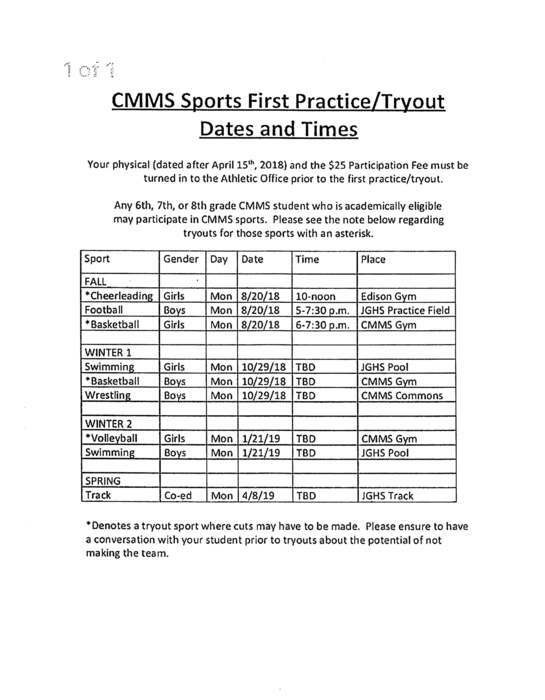 Please see the attached flyer regarding tryout/practice dates and times for CMMS athletics.